Imagine this. You and a friend go to your favorite coffee shop for a visit and a latte. You sit there for 2 hours having a lovely conversation. Your friend catches you up on all that has been going on in her life, shares stories of the family, up coming plans and tells you of a struggle she's been having. Time flew by and the lattes are done. You head out the door and get in your car to leave when suddenly you think, "Wait. What just happened here? I didn't get a word in. She did all of the talking and I could only listen." Sometimes I think that is how God feels with us. 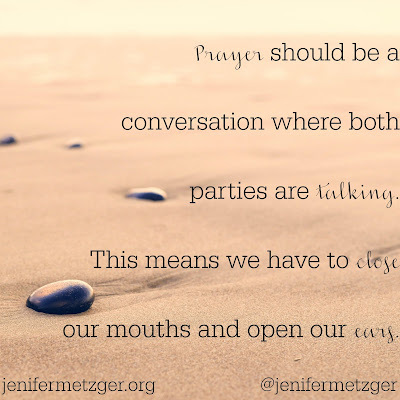 We pray, yet the entire time it is us doing all of the talking and God doing the listening. We never stop so that He can have a chance to speak to us. That's not a conversation. It's called talking. Prayer should be a conversation where both parties are talking. This means we have to close our mouths and open our ears. Think back to when you were getting to know your husband in those dating years. Or maybe when you were first getting to know a good friend. The two of you would both talk and share stories and experiences. If you were the only one doing the talking, you would never have gotten to know the other person. It's the same with God. In order to get to know Him, we must listen. ...Speak for your servant hears.